Speke Bay, I’m a Regular Now! 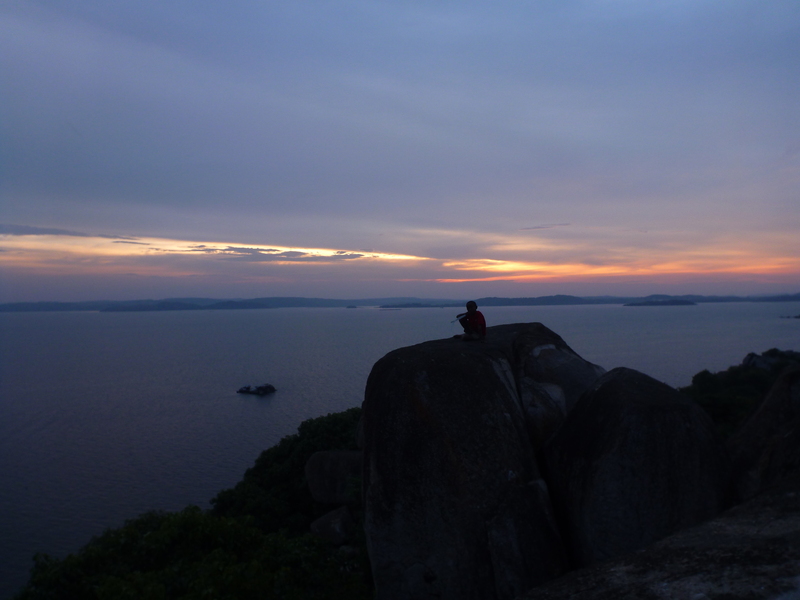 We left from Mwanza on Saturday and drove the 2 hours to Speke Bay. I was happy because there’s lots of cows on the way and I LOVE COWS!!! We arrived at Speke Bay and walked down the path to check in at reception. Because I’d been in the car for 2 hours, I had to do a number #2 really badly, so I found a nice place OUTSIDE where I’ve been taught to do my business. But just as I assumed the position, a man said, “He isn’t very well mannered is he?” Well, Mister, actually, I am! I was outside, and I don’t exactly read English (I just type it) so how was I to know that I was pooping in front of the reception? Jeez! 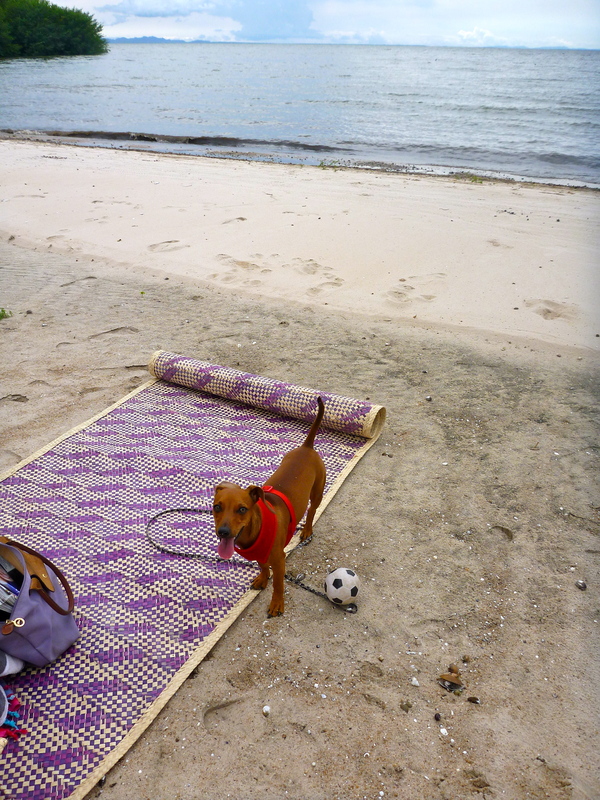 After we checked in (and my poop had been cleaned up), we made our way down to the beach for some afternoon fun. Mom brought my ball so I got to run around and chase it and squeak the crap out of it. Later, mom let me run without holding my leash, which is way more fun because mom is slow and when she doesn’t hold me, I can go as fast as I want, and I’m REALLY fast. 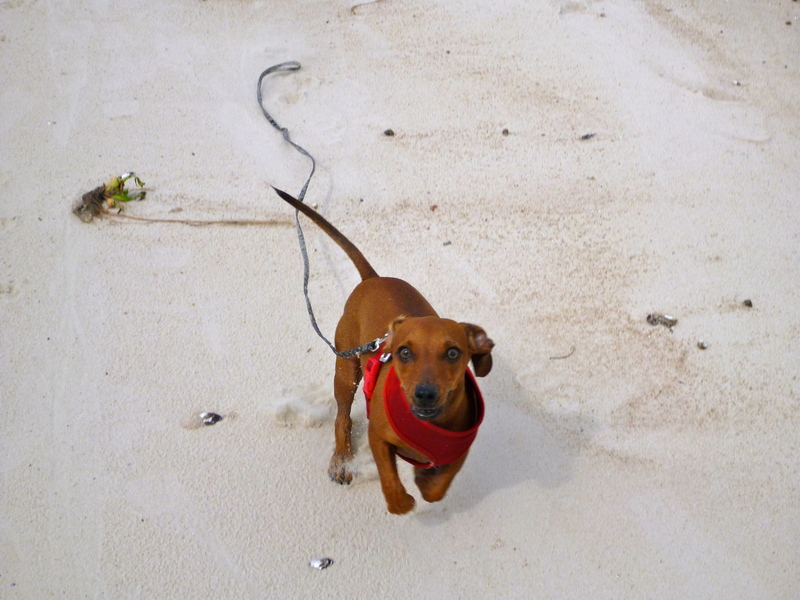 I’m so fast, that I made it down to the end of the beach where I saw a small green slithery thing with big teeth. Mom screamed because she said it was a baby crocodile. I’m brave, so I chased that baby crocodile into the water and then forged ahead into the tall grass to hunt for some more crocodiles. But I think this freaked mom out because she started screaming my name, louder and louder. Eventually, I realized I was gonna be in BIG trouble if I didn’t come out and also, when mom is that upset, usually there’s a good reason, she’s gonna be a doctor, you know. Anyhow, I came back to mom, but I was still in a chasing mood, so I pretended she was the crocodile and I stalked and chased her instead. 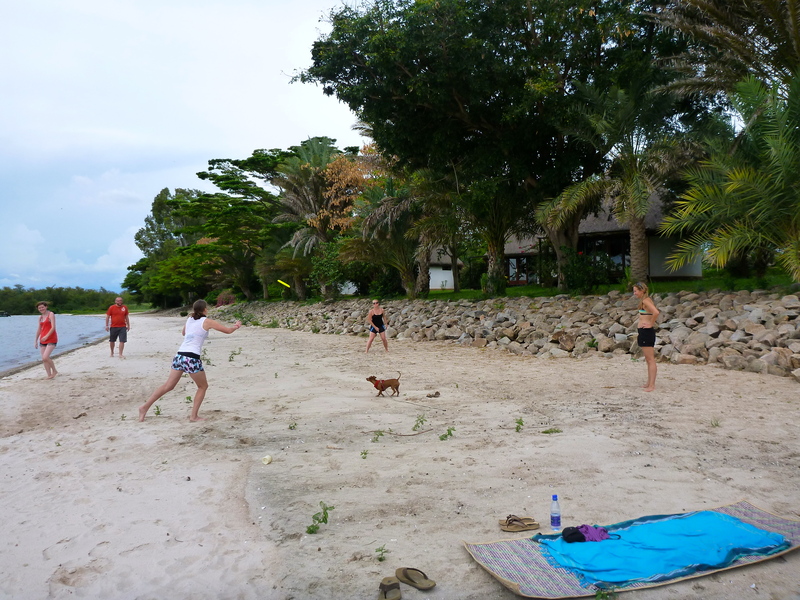 After I was tired of chasing mom, I decided to play some frisbee with Aunt Amanda and the others. 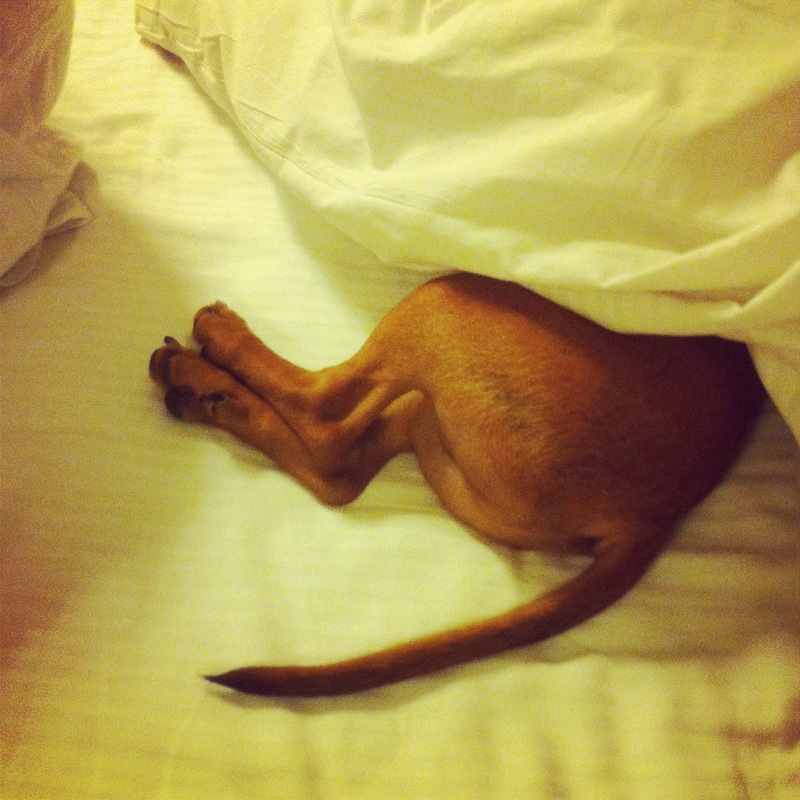 After all this action, I was pretty tired, I am a small puppy after all. So, while the humans had fun playing weird games and drinking weird drinks, I slept in mom’s lap and I loved every second of it! 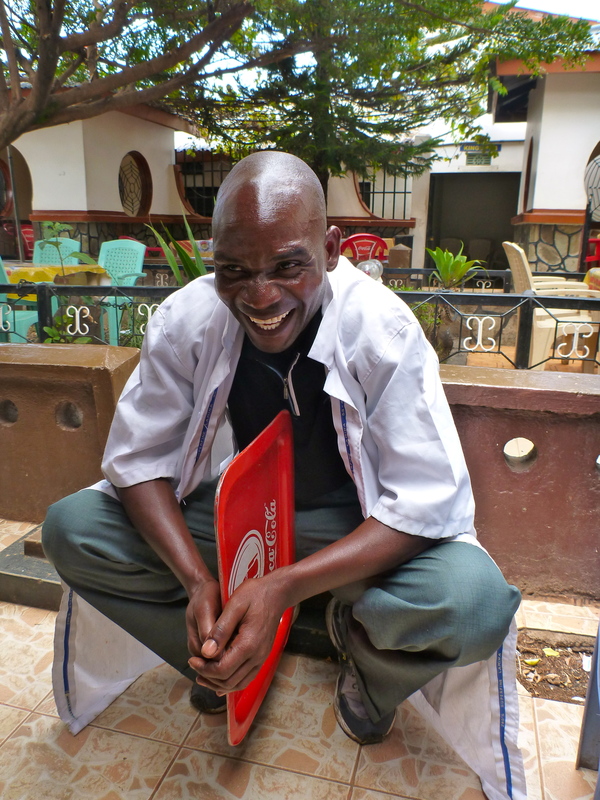 In general, people in Tanzania and Kenya seem not to like me, which is weird because in the US everyone loved me. I’m discriminated by Precision Air, and many other places because I’m a dog, but there have been a few gems in my travels. 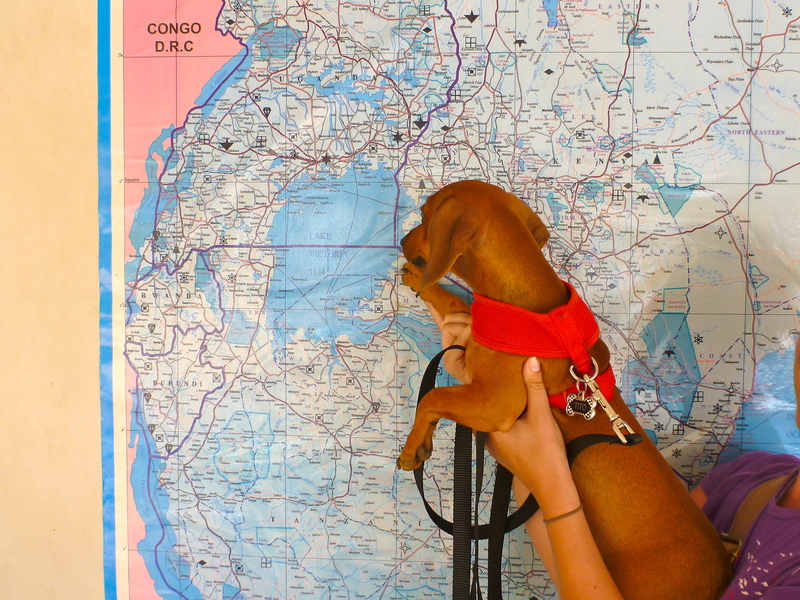 I want other doggies to have an easier time than me while traveling Africa so I’m going to keep a running list here of the places where I’ve been welcomed. All the people that worked at the Hilton were excited to see me and quickly learned my name. Everyday at breakfast they would greet me by name and also they gave me my first meal of goat, yummy! When my mom went back to the Hilton a month after our stay without me, everyone remembered me and asked where I was, they missed me! The people at Ryan’s Bay were super welcoming to me after a long drive from Nairobi. 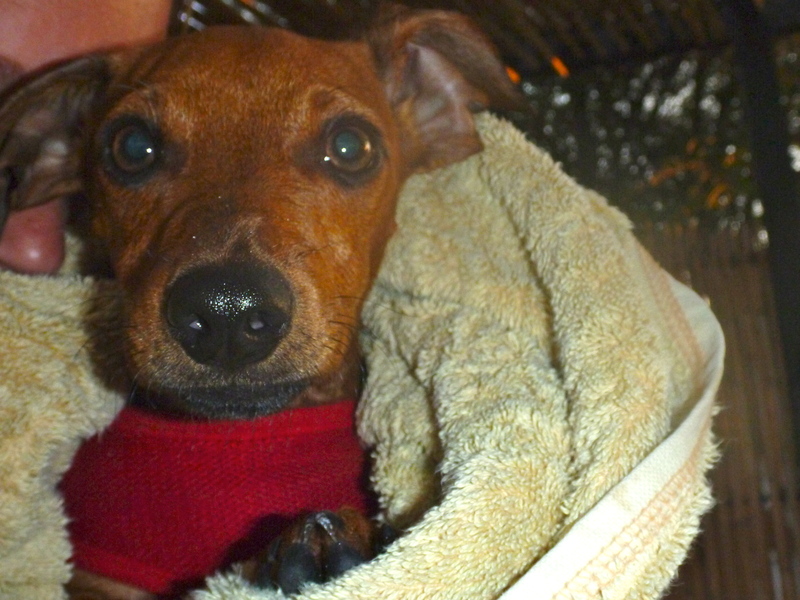 Even though I only stayed there for one night, I kept going back for dinner because the people were so nice to me. 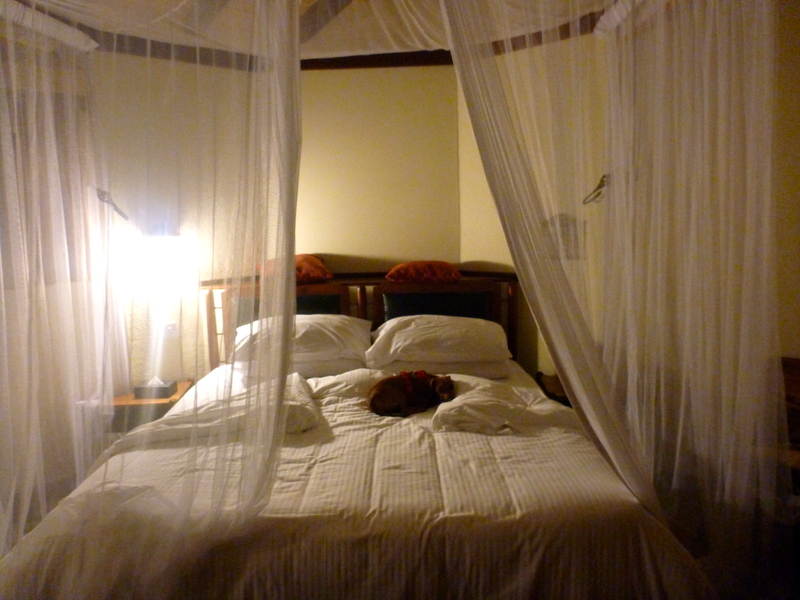 The room was huge and I had a great view of Lake Victoria every night at dinner. 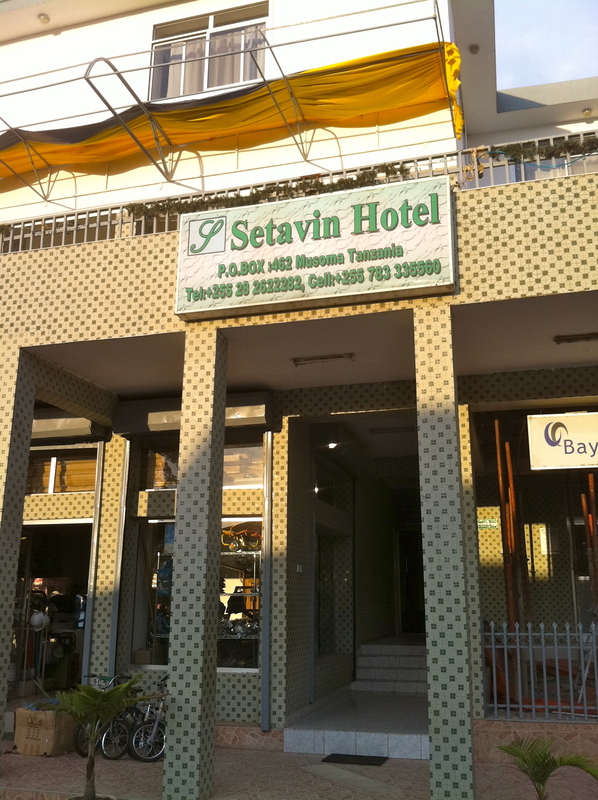 Mom and I weren’t expecting much from the hotel selection in Musoma because Marcel had warned that the town was similar to Butare in Rwanda, however I was pleasantly surprised with Setavin Hotel. The people who worked there accepted me right away and all learned my name and also helped me practice the ‘sit’ command. 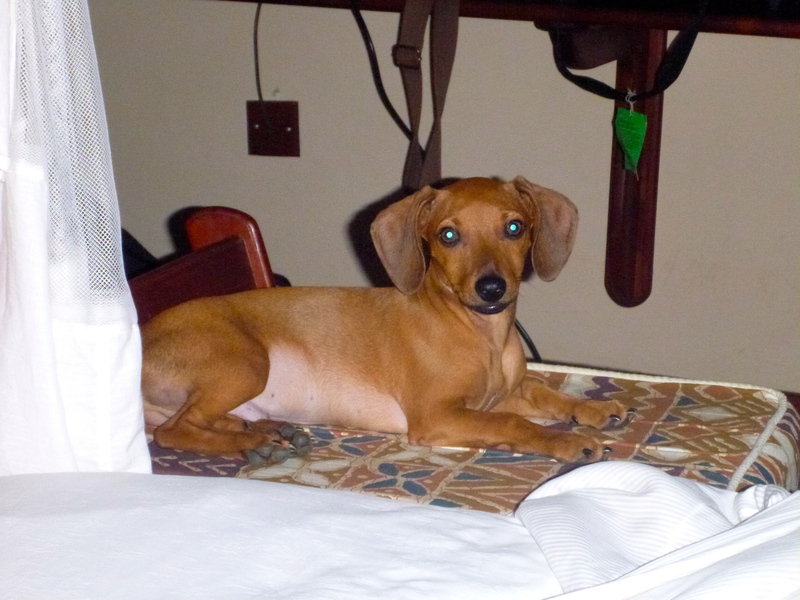 The room was super clean and I had fun playing on the balcony while mom had dinner and breakfast. Before I left, all the staff made sure to say goodbye and one of them even fed me by hand! We arrived here late at night and the guards and the reception were so nice and welcoming to us. They smiled at me and quickly checked us in and showed us to our wonderful room. 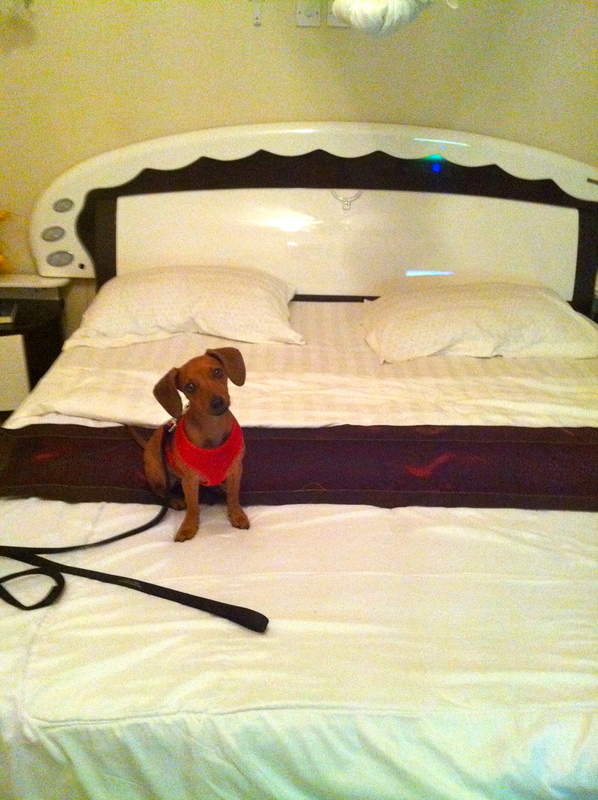 The beds were comfy and had nice fluffy duvets. We were really hungry so we ordered room service at 12:30am and it came quickly. 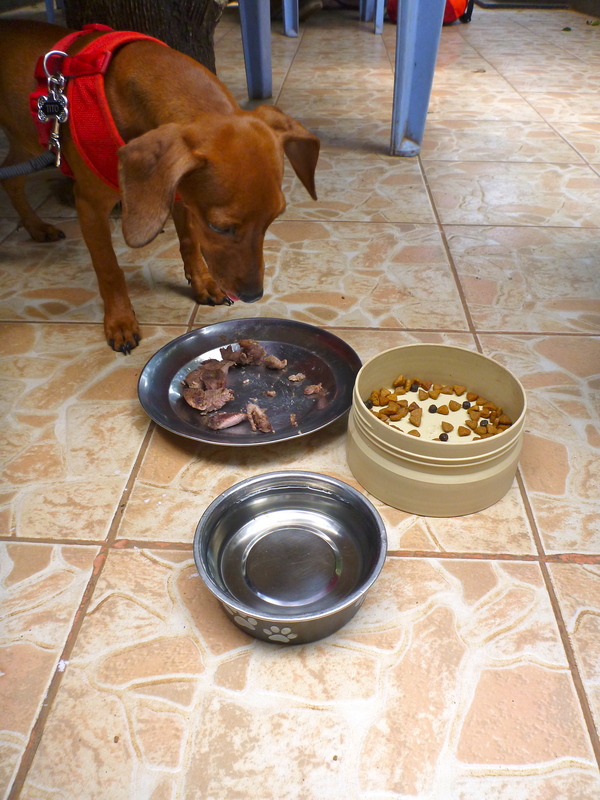 In the morning, the humans had a yummy breakfast buffet and I got to play in the huge gardens surrounding the hotel. Five paws for the Snowcrest! 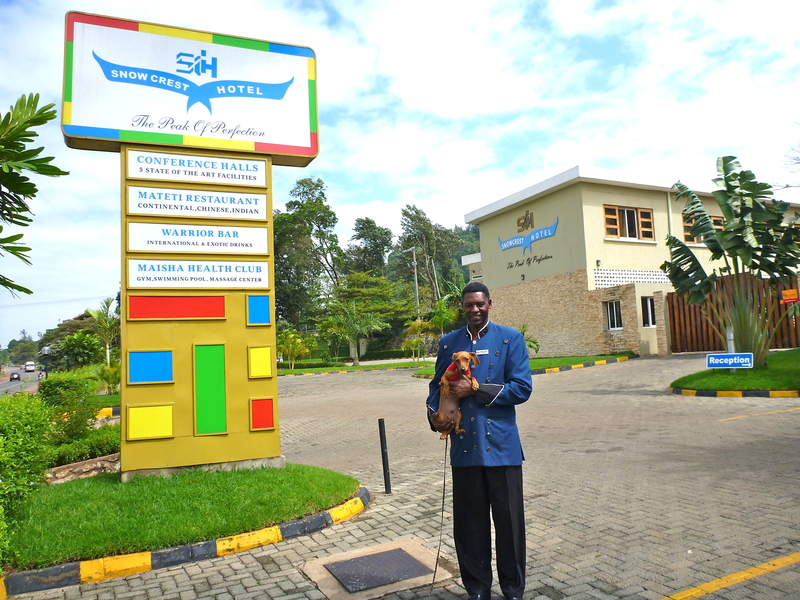 This may be the only hotel that will allow dogs like me in all of Dar es Salaam, even though it’s a big city and the capital of Tanzania at that. Mom, Sham (our awesome taxi driver), and I drove and drove and drove around the city looking for a place we could stay for almost an hour in the very early morning and the Peacock Hotel finally welcomed us with open arms. They allowed us to check in at 7:00 am so that we could sleep after two long days of flying. The rooms are clean with big, comfy beds, a tv, free wi-fi, and air conditioning. 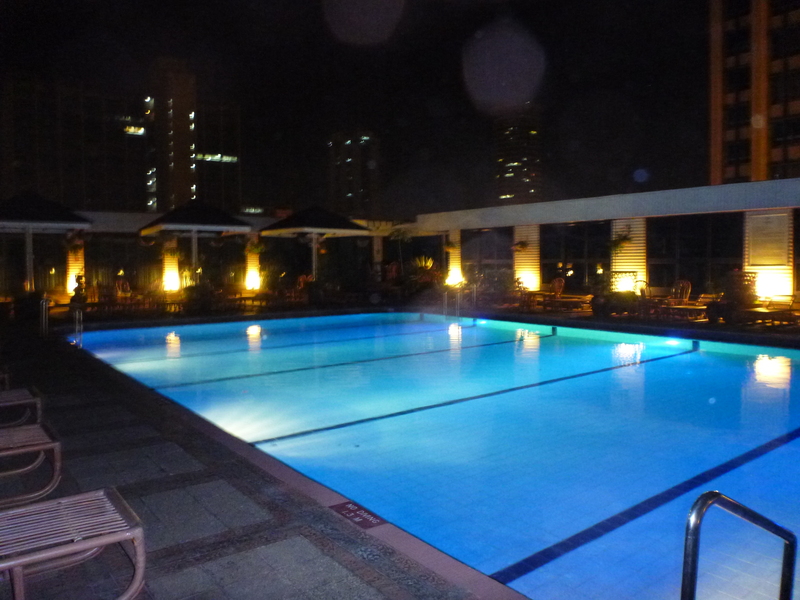 We truly loved everything about our stay here! 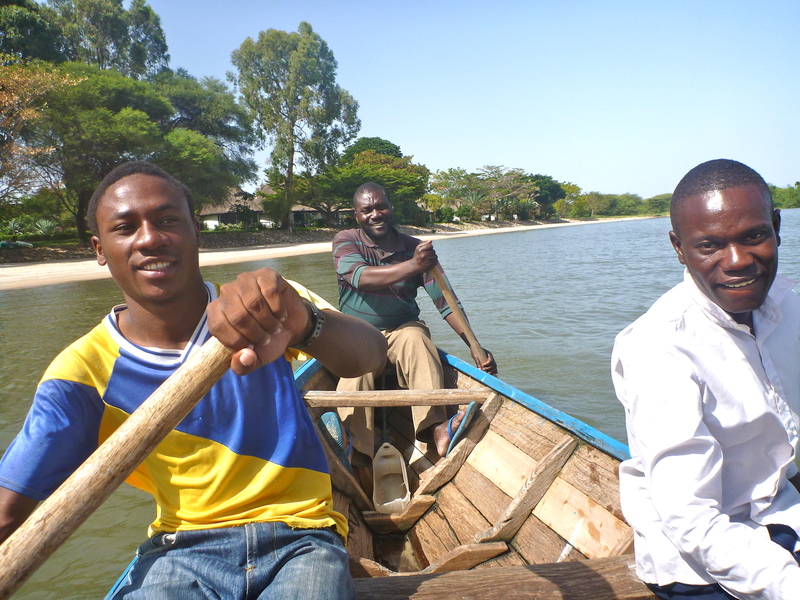 On Saturday, before the epic party at our house, mom, Marcel, and I took a traditional canoe to a Sukuma fishing village about 2 hours outside of Mwanza. We had an awesome guide named Robert who told us that the Sukuma are a tribe in Tanzania. The name means, “people of the North” and the Sukuma are the largest tribe in Tanzania. 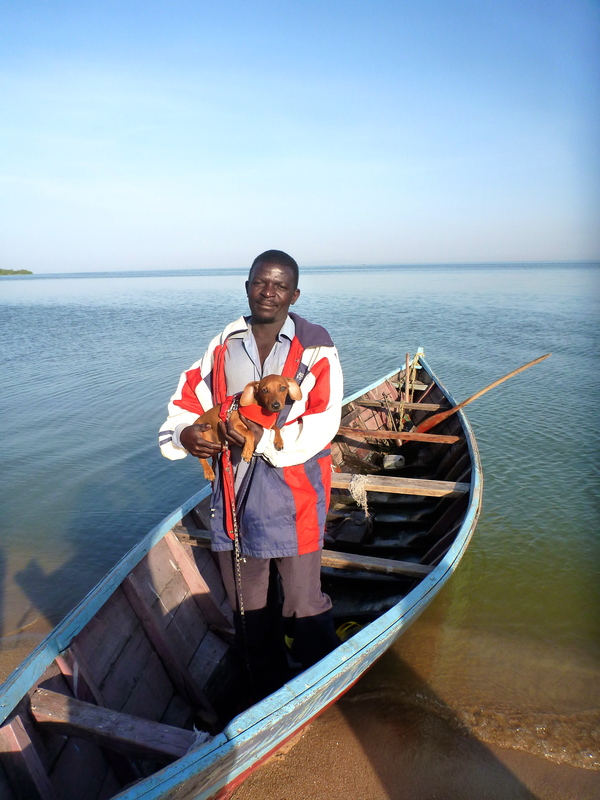 Because the Sukuma live in the northern part of Tanzania on Lake Victoria, their livelihoods are often based around fishing. 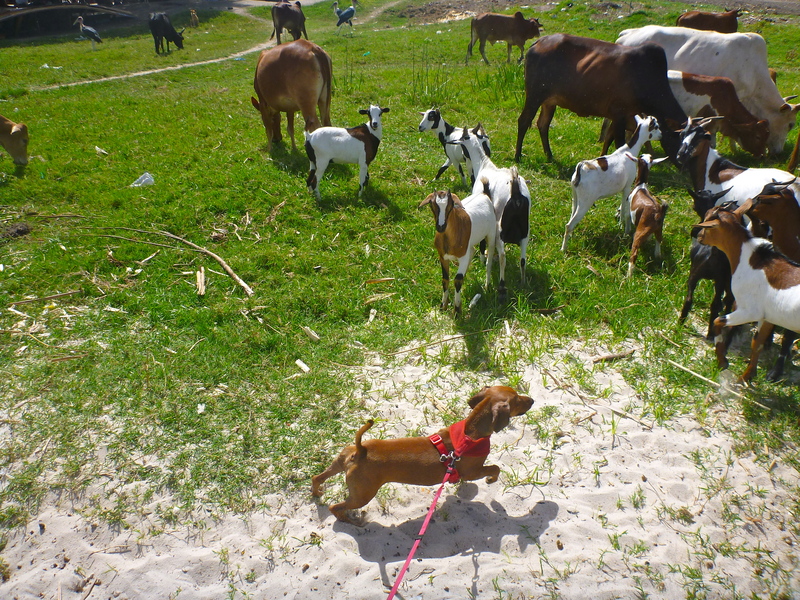 When we arrived on the shore of the village, there were a bunch of goats, cows, and humans to meet us. Cows are quickly becoming one of my favorite animals and goats are OK too. The thing about goats is that they are a really good size for me, but they never want to play. It’s actually a little the same with the humans, all I want to do is have fun, but everyone is afraid of me. 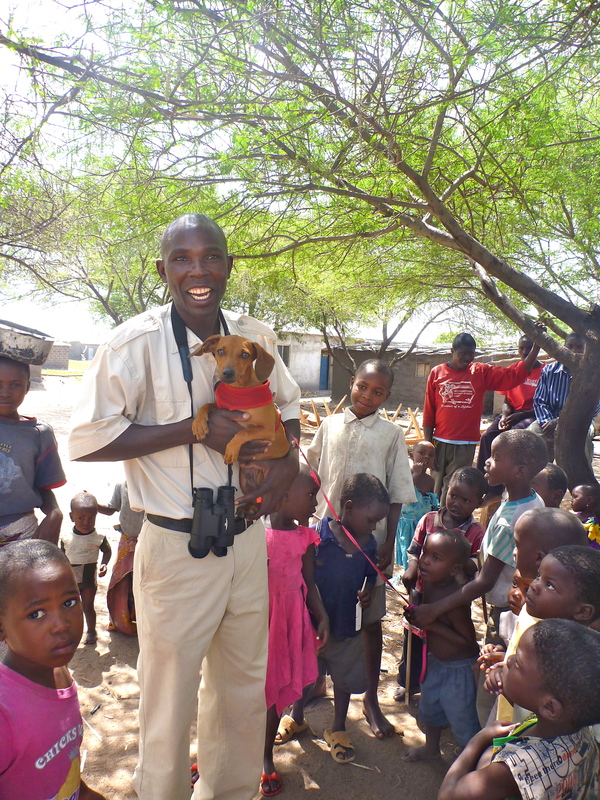 Because of my ‘Mpende Mbwa‘ mission, I decided that it would be different in this village, I was going to MAKE people like me! 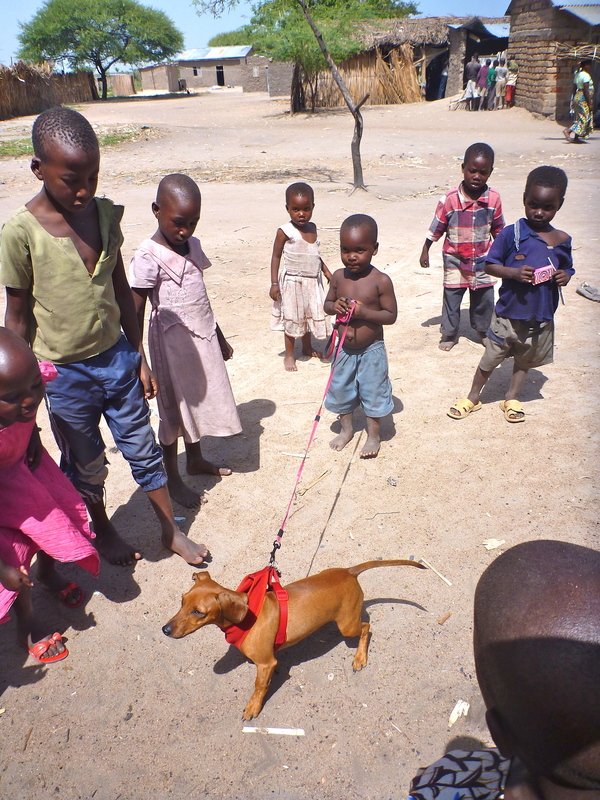 After some time walking around the village, a tiny boy took my leash from mom’s hand and decided to walk me. 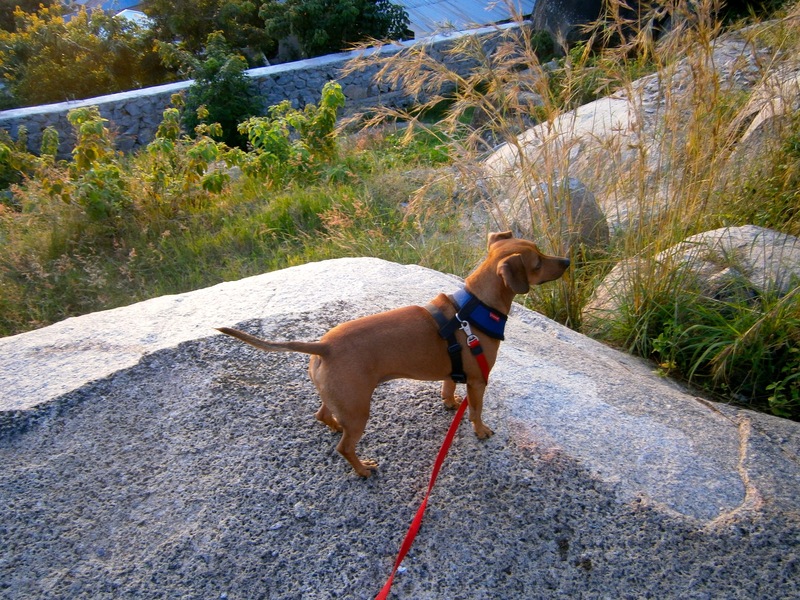 I was impressed at his leash skills, especially since I’m sure he had never tried it before. I attempted to be gentle with him, but at one point I saw a bird, and you know how I love birds, so I took off running. The poor little boy tried to keep up, but in the end I was too fast and he went flying through the air and rolled on the ground. But he was a trooper, he just got right back up and laughed it off! By the end of our time in the village, Robert said all the little kids wanted to keep me and also that they would all be talking about me in school on Monday. 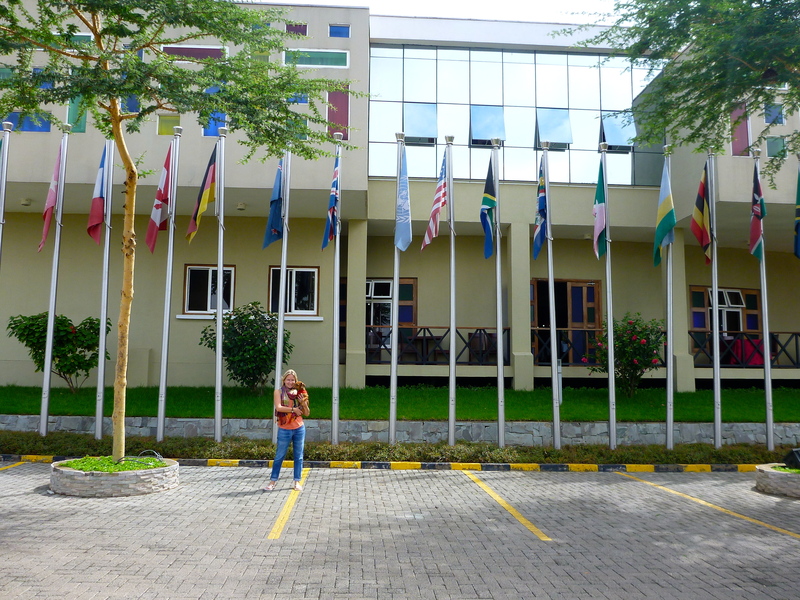 I like that I’m a minor celebrity here in Tanzania! 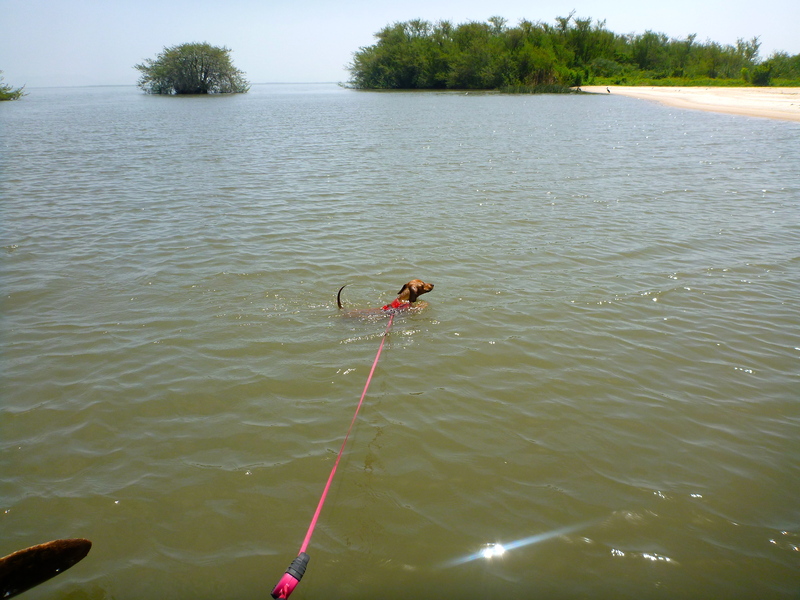 On our way home, mom decided that I should practice my swimming skills. Little did she know, I would be practicing my diving skills as well, just to make her proud. If you want to see live action of me in the fishing village, click this link: http://youtu.be/hs_EksiP6Ic. Mom says she uploaded a video of me onto youtube! 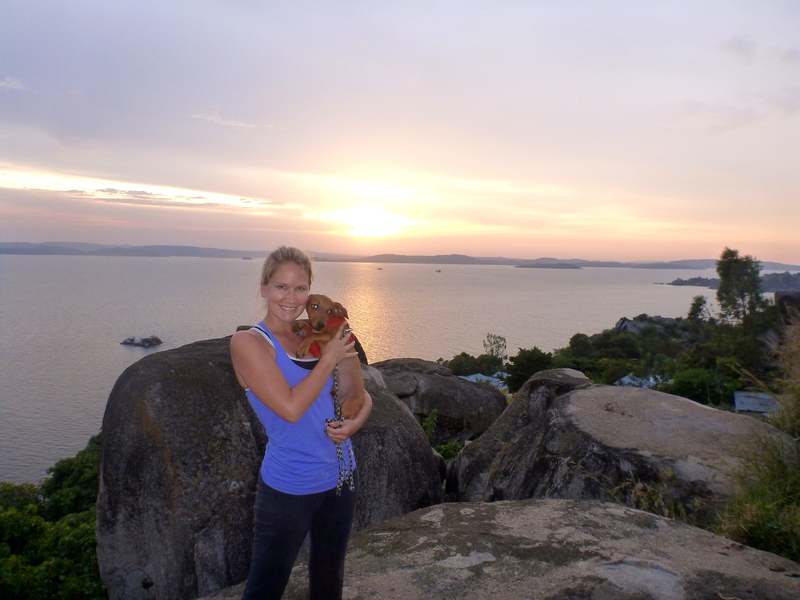 Yesterday mom and I went hiking on the rocks in Mwanza overlooking Lake Victoria. The best time to go hiking is sunset because when you get to the top the view is surreal. I’ve never seen anything like an African sunset. I may only be 6 months old, but I’ve had the chance to see sunsets in Kenya, Tanzania, and the USA, and the sunsets here are by far the best. I think it’s because we’re so close to the equator so the sun sets very quickly and this occurs at roughly the same time very day. In fact, the sun sets so rapidly that you can actually watch it move and disappear below the horizon. 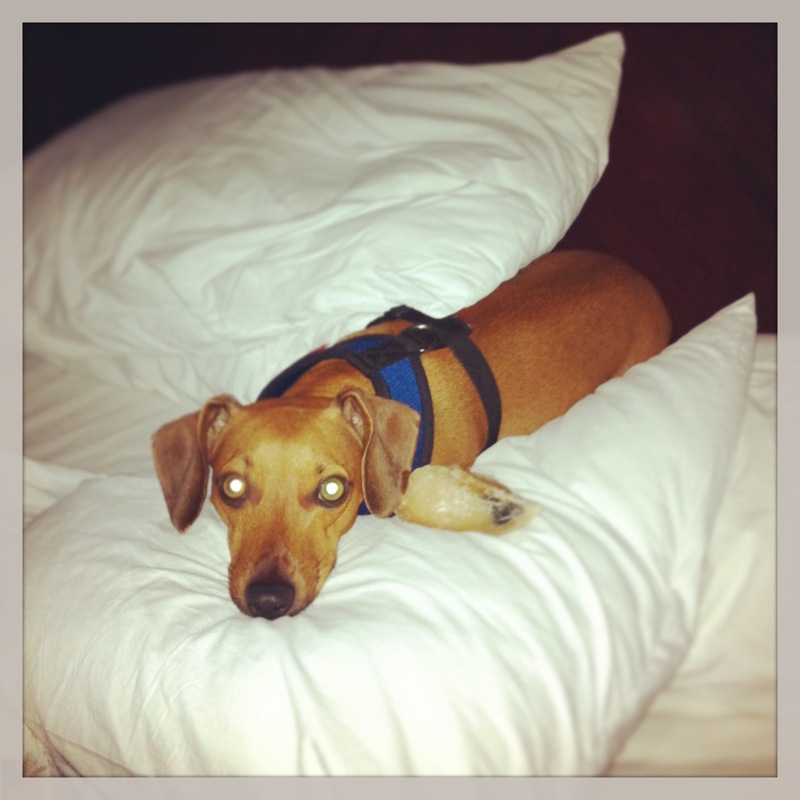 This is perfect for me, since I’m such a young, little dog and have ADHD! I think another reason that the sunset here is so beautiful, is that the colors are framed by the rocks and the lake. You all MUST come see what I’m making such a fuss about! 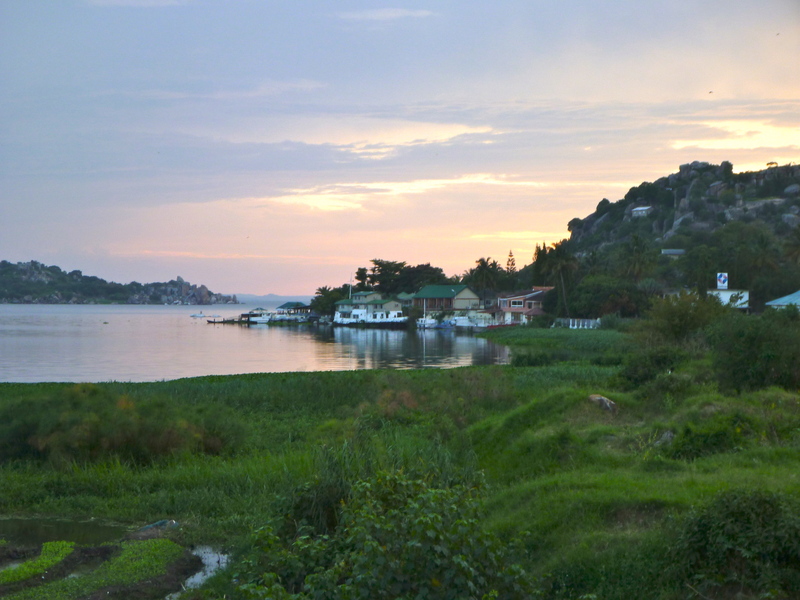 Last week, mom was super frustrated with Mwanza, so she decided that we needed to get out of town. 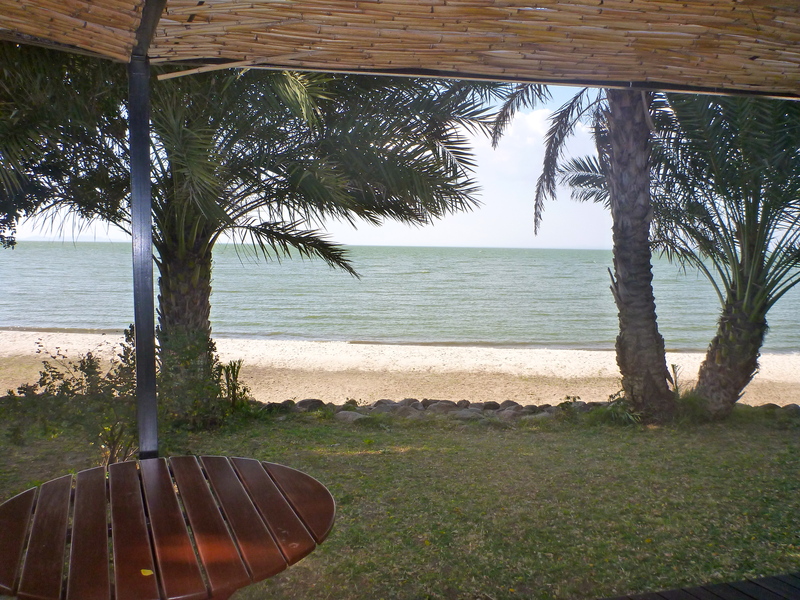 I am always up for an adventure and I love exploring Tanzania, so she decided that we would drive North towards Kenya and visit the town of Musoma on the shore of Lake Victoria. 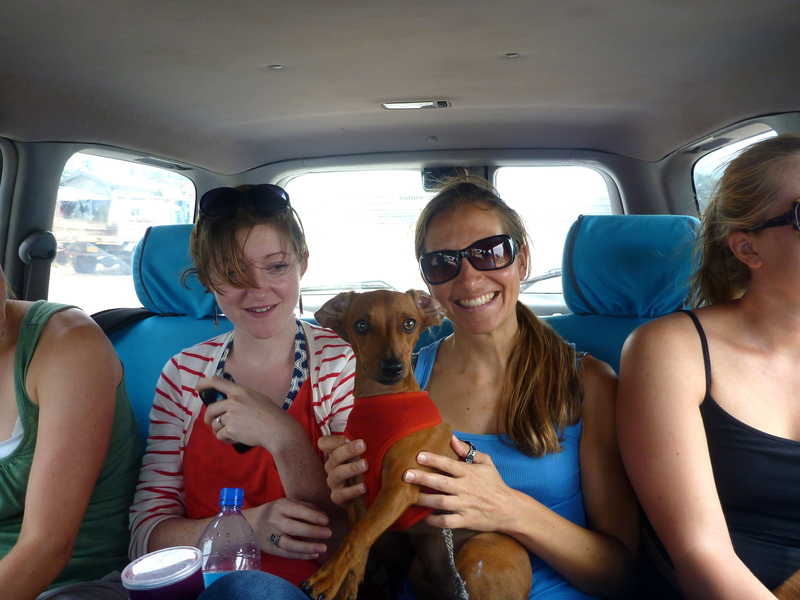 Since we were hitching a ride with mom’s friend Marcel, we had to go to the border post of Sirari first, which also happens to be the very first place I ever went potty in Tanzania! Oh, the memories! 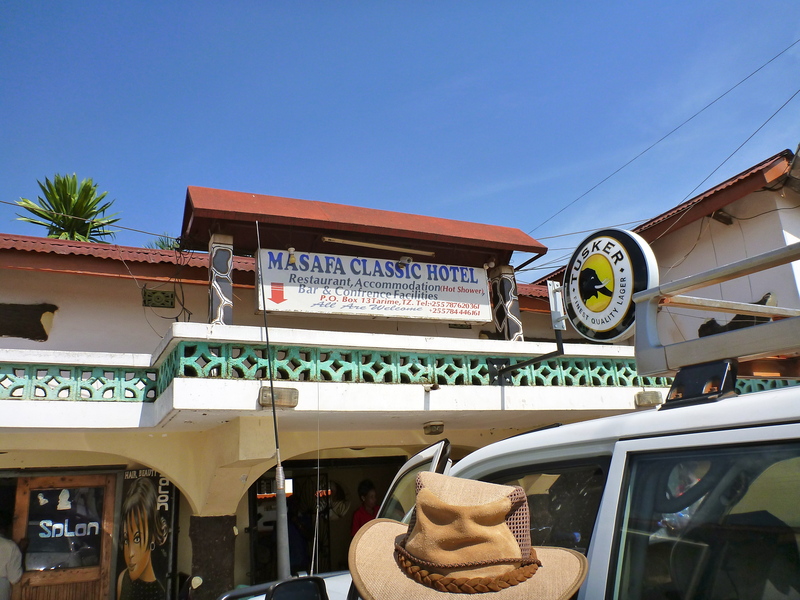 I’d also like to give a shout out to the awesome humans at Masafa Classic Hotel in Sirari. 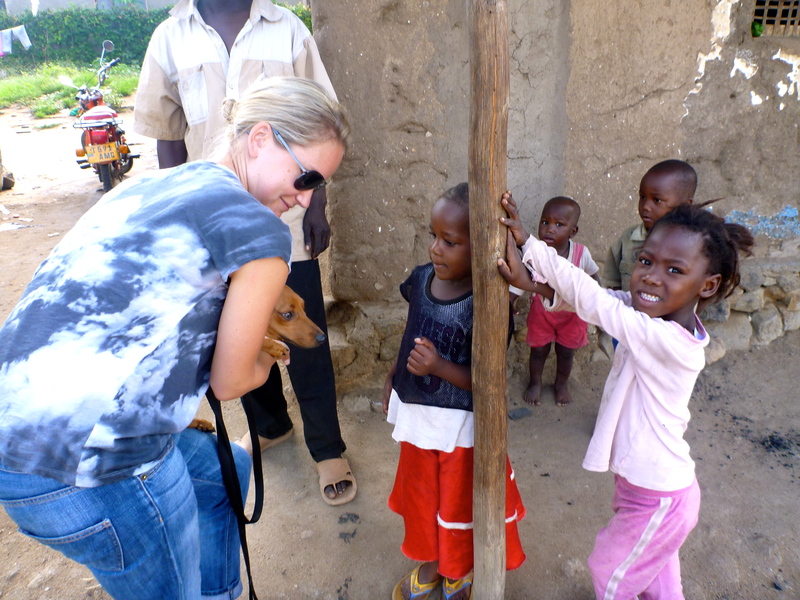 So many times in Africa, I’ve gotten my feelings hurt because people are scared of me or they just don’t like doggies, however the people at Masafa welcomed me with open arms. I really recommend this place for lunch if you’re passing through Sirari. Our waiter was called Jackson (or maybe it was Franklin, or possibly some other dead US President’s name) and he treated me with so much respect. I was on my best behavior, sitting quietly in mom’s lap as she ordered and waited for the food. Mom ordered a special meal of mishkaki for me (see my previous post on mishkaki for an explanation) and Jackson made sure to ask questions so he got my order just right (well-done. no spices, PLEASE!). No one at the restaurant ran away from me in fear and some people even stopped to pet me on the head 🙂 When Jackson brought my meal, it smelled so good that I ate it as quickly as I possibly could. Yummy, mishkaki! Before we left the restaurant, Jackson asked if he could take my photo with his mobile phone. I was so honored, I’ll never forget him and hopefully I’ll get the chance to visit again before my African adventure is over. After Sirari, we were on our way to Musoma. The people there were very friendly to mom, but as usual, they were all really scared of me. 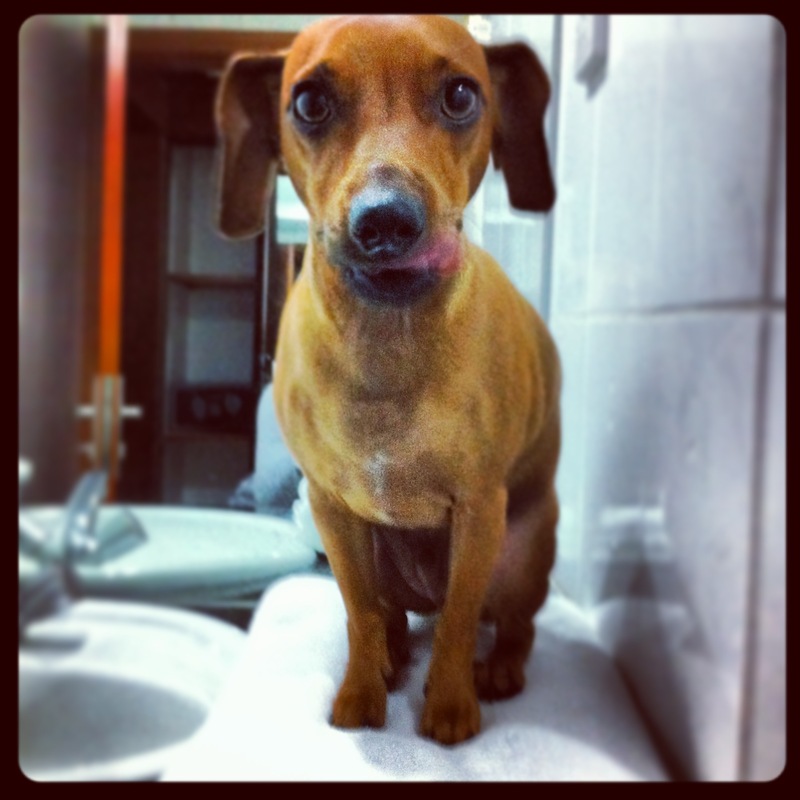 I still can’t figure this out because everyone says I’m so cute and lovable, and I have tiny teeth too! Anyway, mom was determined to show people that I was a different type of dog than they were used to. At one place, she took me out of the car to where a bunch of little children were playing. Children are my favorite because they’re young and carefree like me, plus they’re sized much better for me. The kids were scared at first, but I think they could see how much my mom loved me. She told them my name and where I came from and promised that I wouldn’t bite. Eventually, some of the braver kids started to pet me on my head. 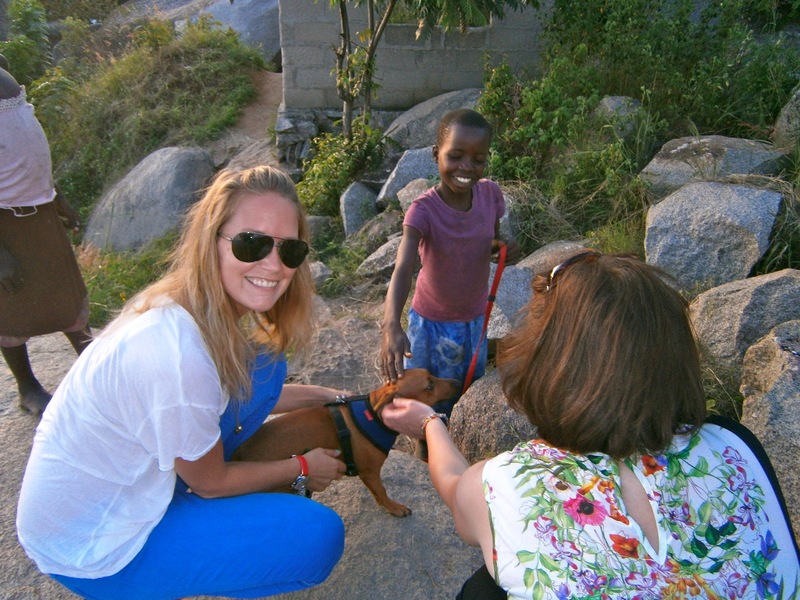 I felt so happy to finally be accepted by Tanzanians and so now my grand plan is to teach kids about puppies and how we can be nice. I’m excited about my new Tanzania mission, I think I’ll call it “Mpende Mbwa“! Beginning my mission, "Mpende Mbwa"! 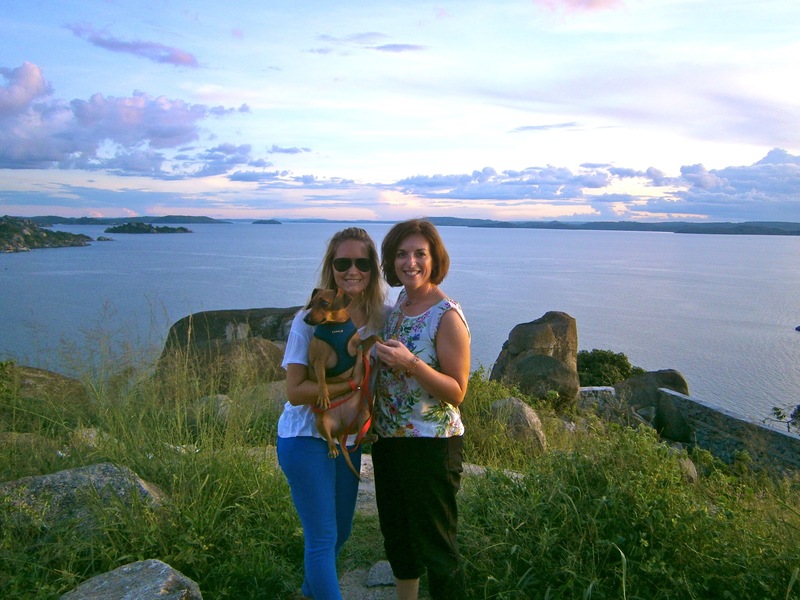 This past weekend, my mom and Aunt Amanda decided they needed a break from Mwanza so they planned a special trip to Speke Bay on Lake Victoria. Marcel, mom and Aunt Amanda’s friend, agreed to drive us, but he was a little worried about my car behavior. 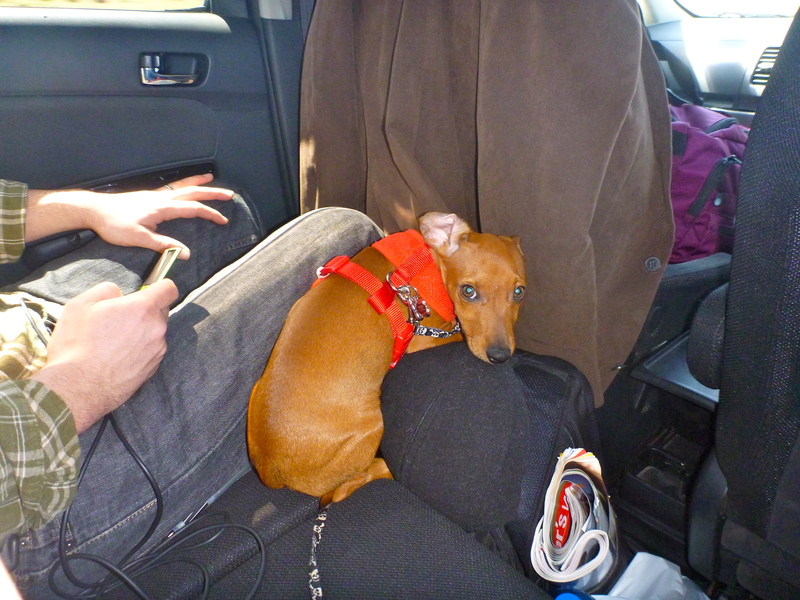 However, I showed him how good of a travel puppy I am. 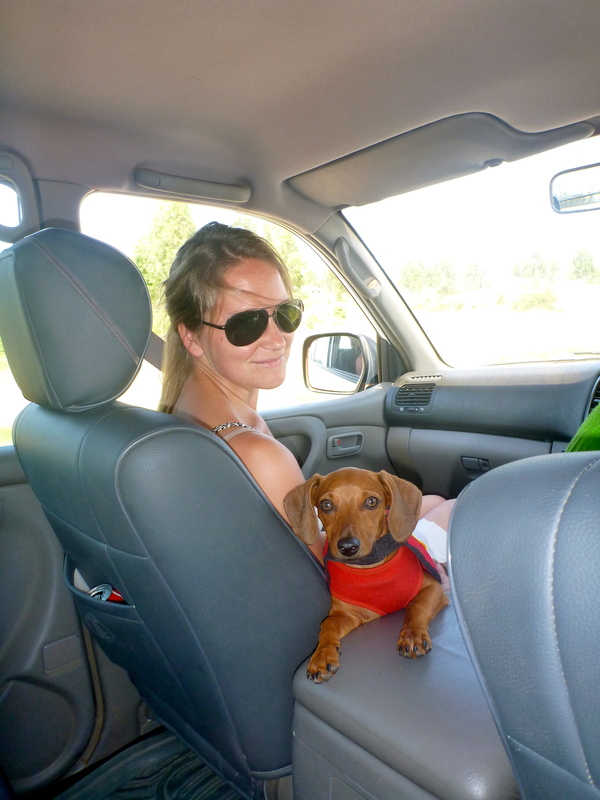 Seriously, I can be a very chill puppy in the car because I like traveling so much; I think I get it from my mom! 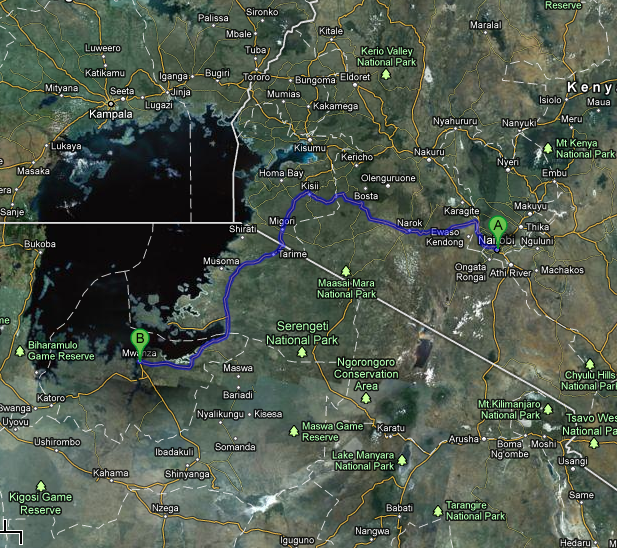 It only took us about 2 hours to drive from Mwanza to Speke Bay. When we got there, we walked straight to the beach. WOW! I’d never seen anything like it. Powdery white sand and water for as far as I could see. 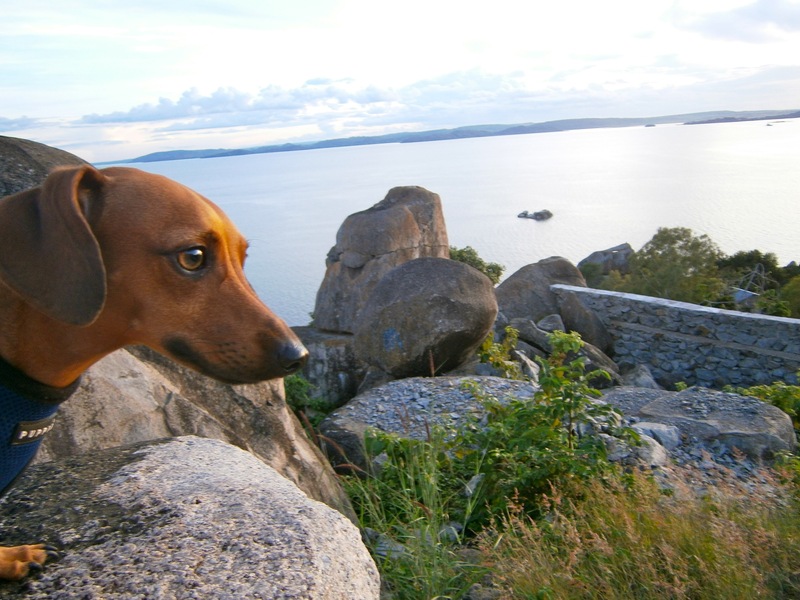 Mom says that Lake Victoria is the second largest freshwater lake in the world. It was truly huge! 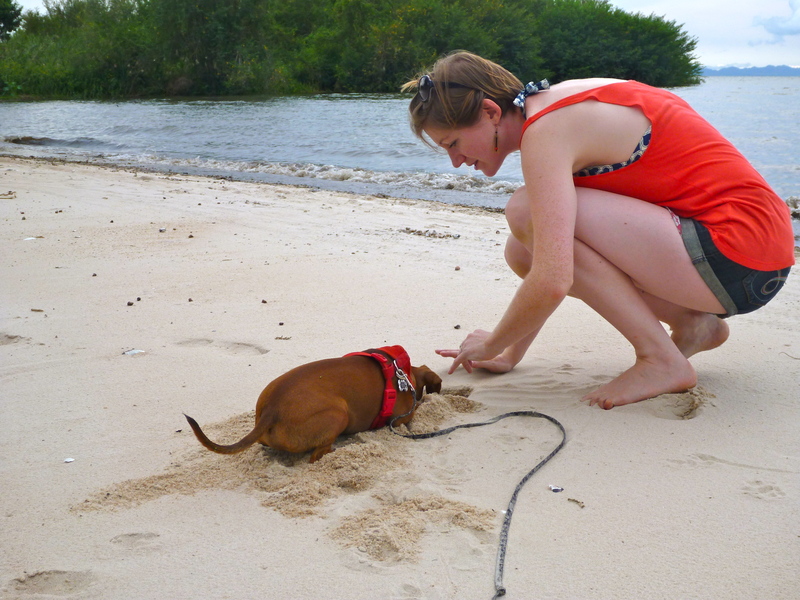 Also, the sand was super fun to dig; much easier than regular dirt. 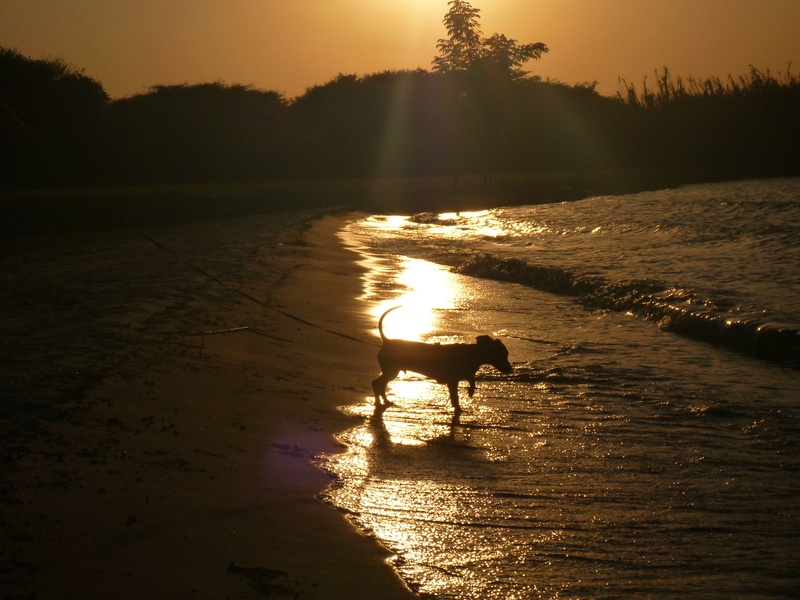 That evening, I ran around and dug tons of holes just to feel the grains of sand slip through my paws. Later on, we took a sunset walk on the beach. I was so content, warm weather, beautiful beach, a vivid sunset, not at all like cold Ithaca! 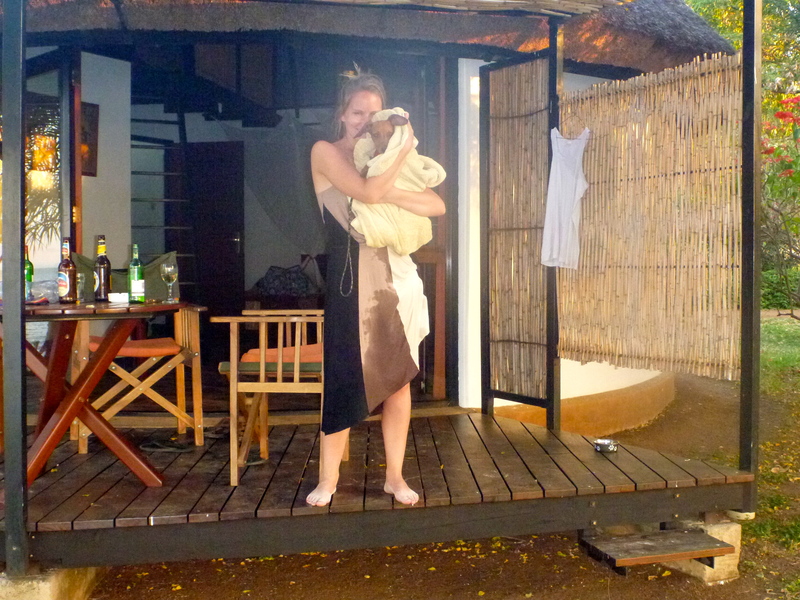 I can’t believe how lucky I am that my mom brought me on this African adventure. The following morning, my mom decided that I needed to learn how to swim. I actually had no idea what she was talking about, but she said that I have webbed toes and a long snout so I should be able to do this thing called swimming. Anyway, she took me out to the beach and immediately I saw a bird. Birds are some of my favorite creatures and I’m always trying to catch them. Well, this bird that I saw took off over the water and I wanted to catch it so badly, so I dove in ready to chase it as far as possible. However, quickly I realized that the further I went, the deeper the water became and soon I couldn’t touch the bottom anymore. So, I just moved my arms and legs as fast as I could, like running but instead pushing against water. It was a strange sensation, feeling like I was running through water. 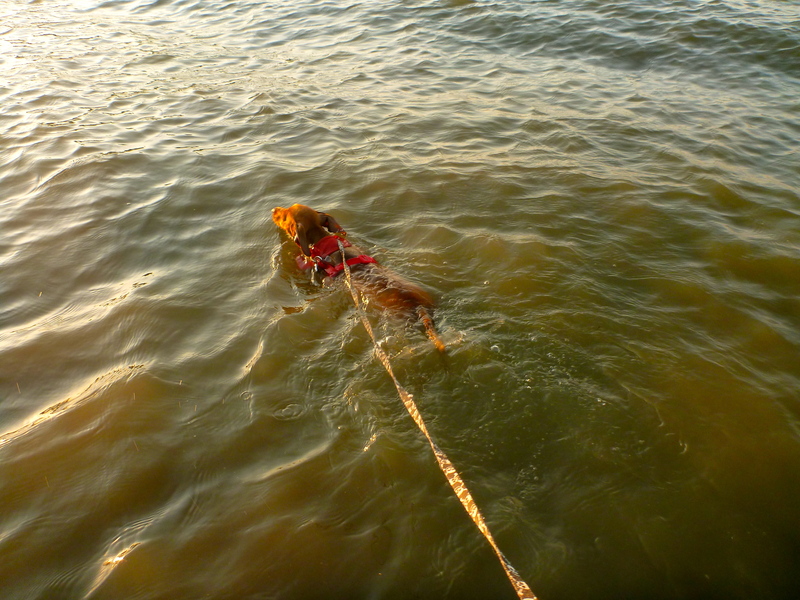 My mom screamed with excitement and said that I was swimming all on my own. I don’t know what the big deal was, but she sure was excited for me. I'm swimming for the first time! Eventually, mom got worried because I wouldn’t give up on chasing the bird. Little did I know that swimming is actually a lot harder than running so she came into the water to save me when I got too tired. She said even though there’s a parasite called schistosomiasis in the lake that we could all just take some pills to make it go away. I’m not worried because I trust my mom, she’s going to be a doctor one day! 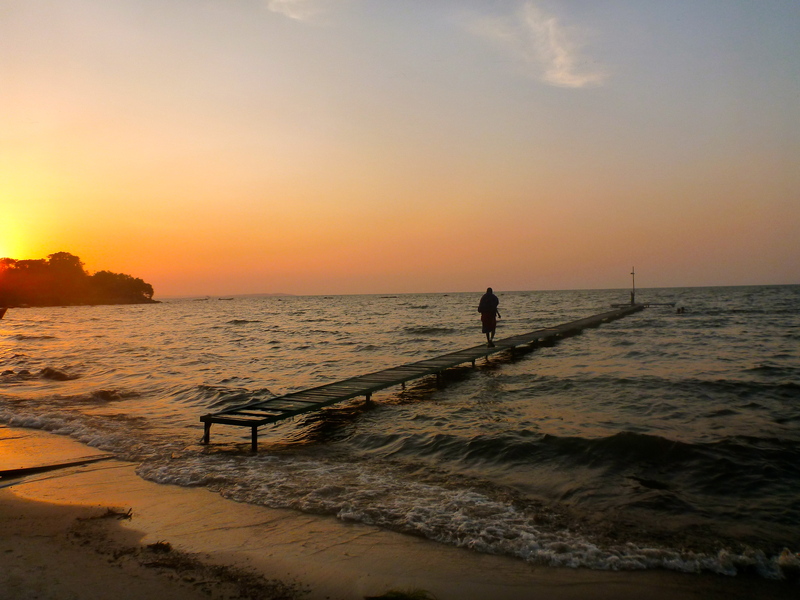 I just swam in Lake Victoria! 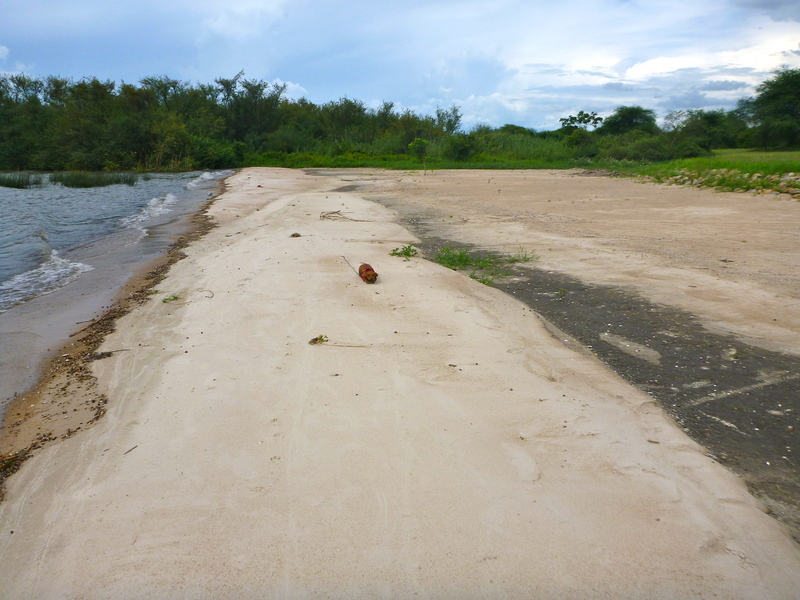 After swimming, we decided to take a walk along the beach to see if we could find any crocodiles. Mom and I found one the first day when we were walking alone, but she was too scared to stay and look at it. 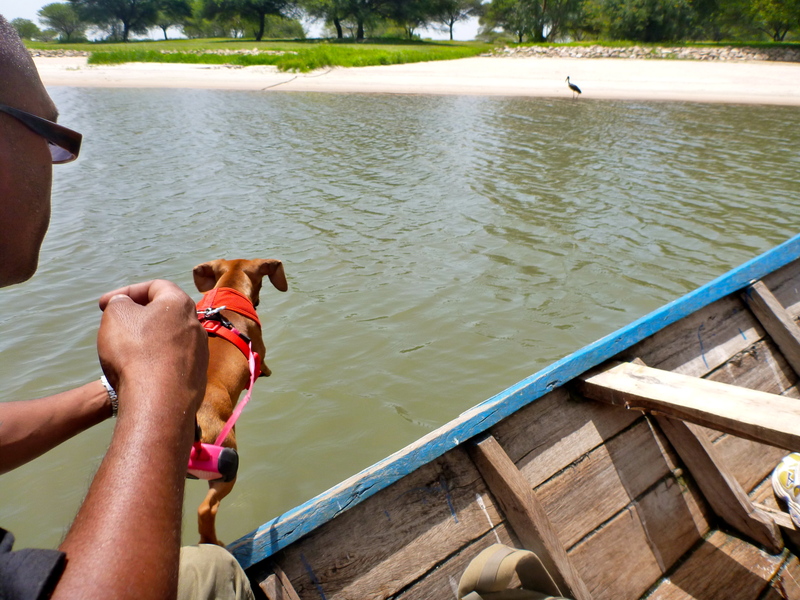 While we were walking some local fishermen came along and one agreed to take a photo of me in his boat. 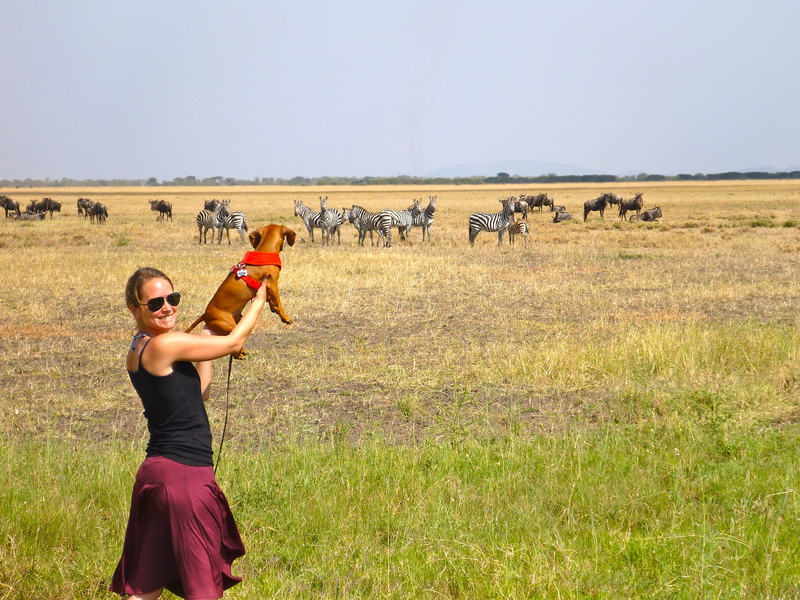 I was really happy because most Tanzanians think I’m going to bite them, which is the funniest things because all I really do is lick. I don’t even have all my adult teeth yet! We left Speke Bay in the afternoon on Sunday and decided to take a quick drive to the Serengeti to see the Western Corridor Gate. Perhaps the coolest part of the whole trip was this impromptu Serengeti trip. From the window of the car, we spotted some zebras and wildebeest, so mom made us stop because she wanted me to see them up close. We tromped through the brush and into the field and got pretty close to the zebras. I really wanted to play with them, although I’ll admit that I was a little scared too. I was enamored with the zebras and just couldn’t look away, but then as we were taking photos along came the park rangers who yelled at us to get out and stop taking photos, party poopers! Anyhow, it was an amazing experience: a weekend of firsts for me! My mom is back from her weekend trip to Nairobi, so now I can post again since she took her computer and the internet with her. 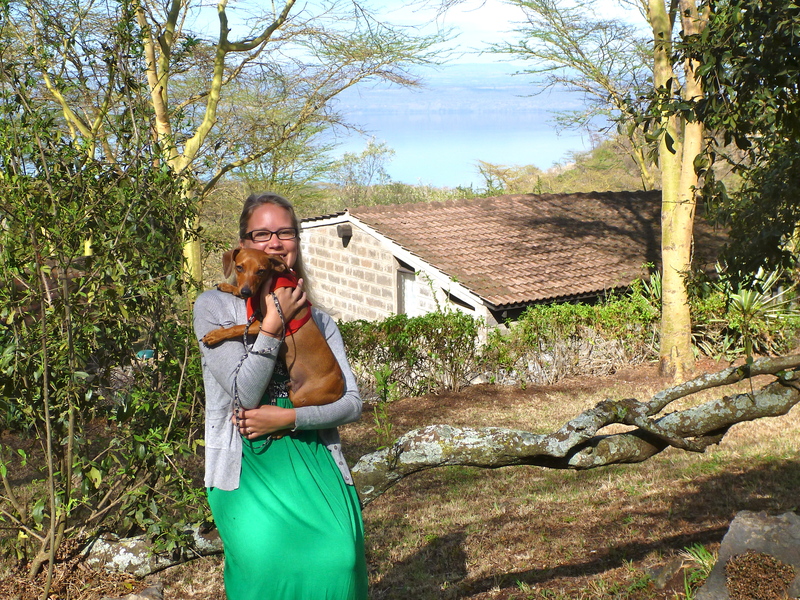 Her journey home from Nairobi was so much easier than mine! 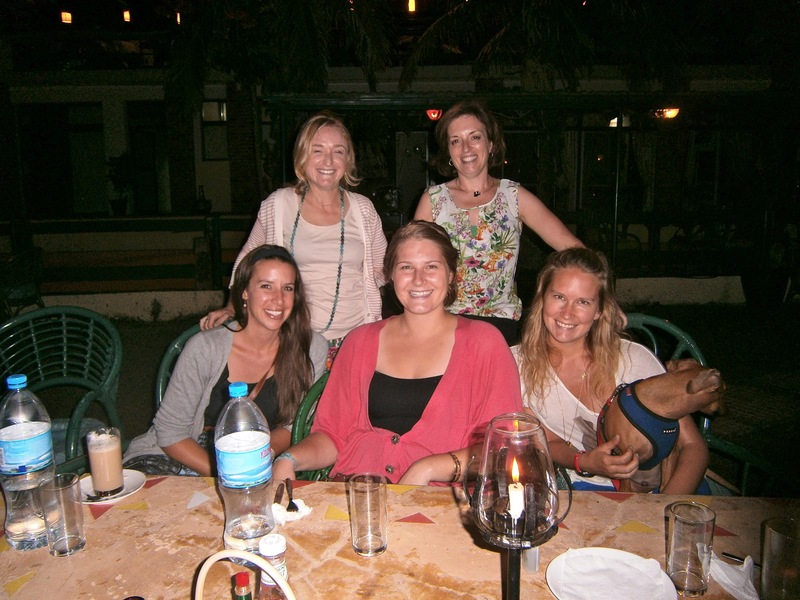 We arrived in Nairobi from Amsterdam at 9:30pm on New Year’s Eve. 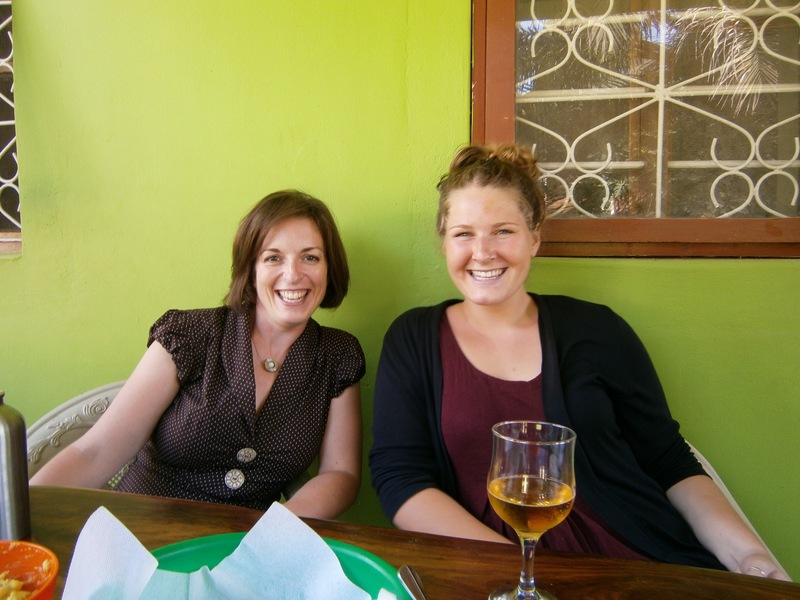 Mom needed to be in Mwanza, Tanzania by January 3rd, but we still hadn’t figured out how to get there. 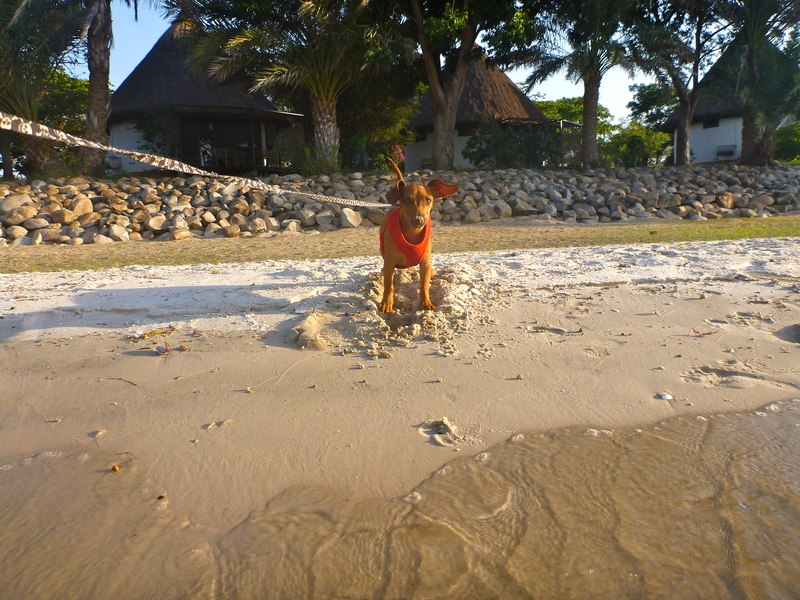 Unfortunately Precision Air is the only airline that regularly flies from Nairobi to Mwanza and they hate little dogs like me, so flying wasn’t an option. Luckily we met a great taxi driver named Michael in Nairobi and he agreed to drive us from Nairobi to the Kenya/Tanzania border where we would meet my namesake and godfather, Tito the taxi driver. 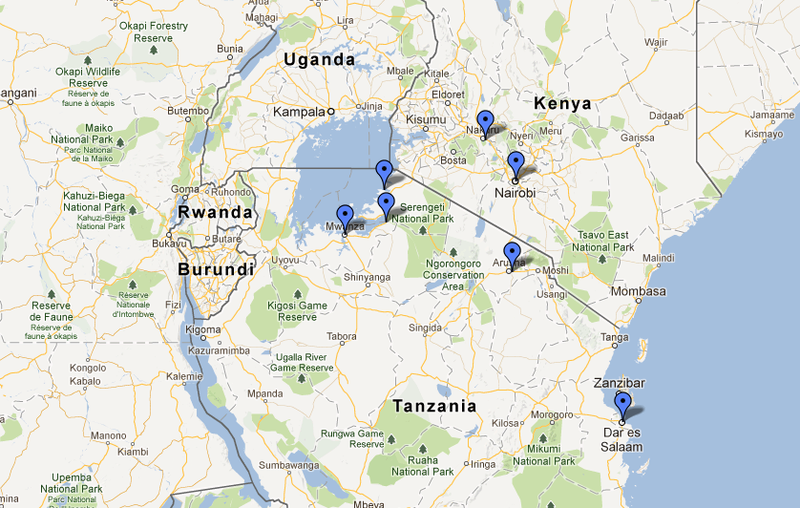 We set out from Nairobi on the morning of January 3rd. 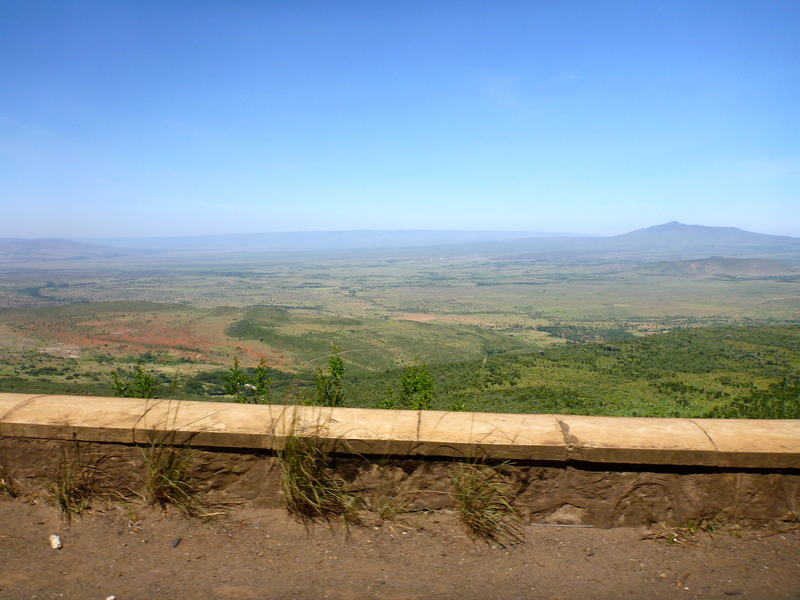 We drove through the Great Rift Valley and saw Masai herders. It was the biggest yard I’ve ever seen! Masai herders with the biggest animals I've ever seen! 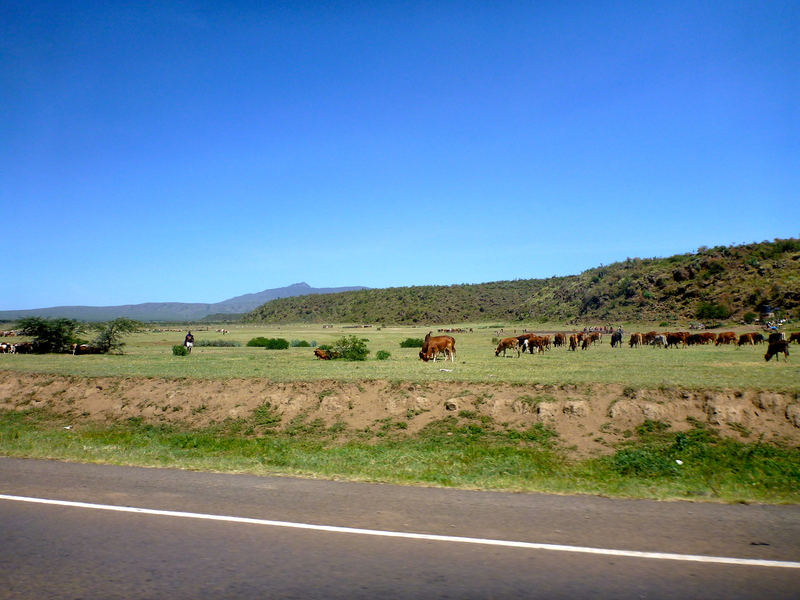 It took us almost 5 hours to drive from Nairobi to the border town of Isebania. In some sections communities built speed bumps so high that the car would get stuck on top. During the day, they helped to push us over, but during the night, it’s much more dangerous. Mom said they even steal things from people this way. Good thing we were driving during the day! 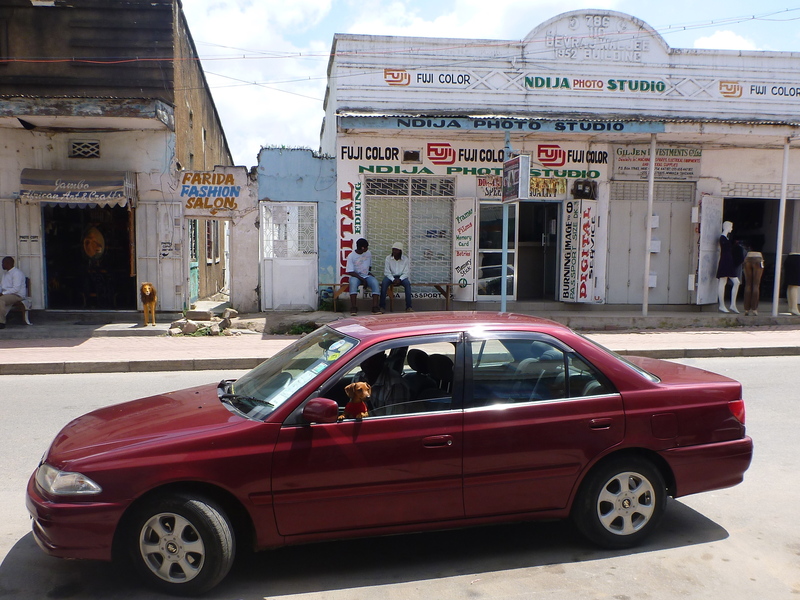 Once we got to the border we easily crossed into Tanzania and the town of Sirari. No one even asked to see my paperwork! We met my godfather Tito at the border and transferred everything into his vehicle to finish the rest of our drive to Mwanza. 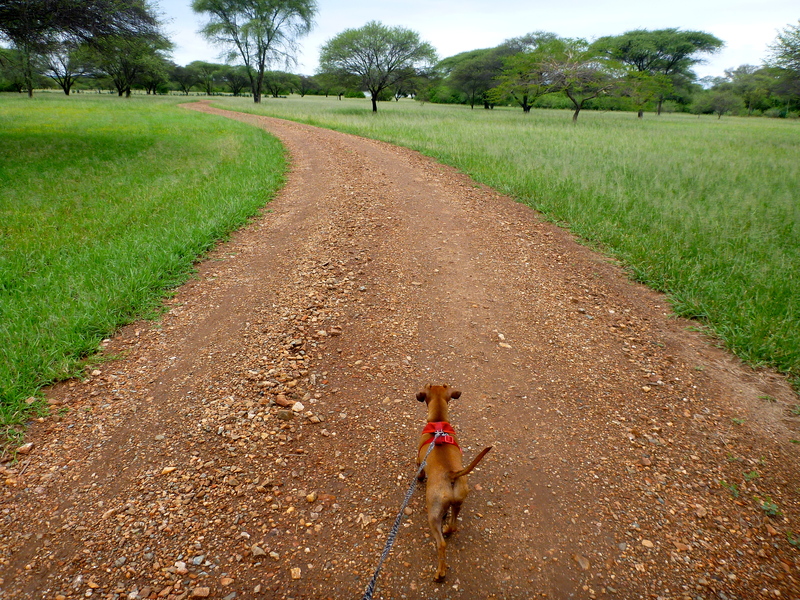 We got a mini-Safari as we drove from the Kenyan border to Mwanza since we were on the edge of the Serengeti. 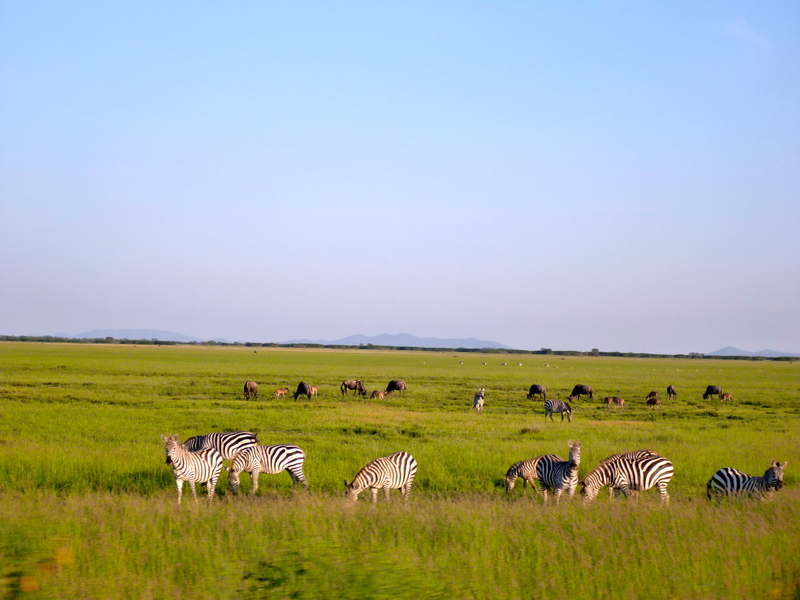 I thought the cows from the Great Rift Valley were cool until I saw zebras in the Serengeti. These giant striped creatures just blew my mind! Mom says that elephants are even bigger and I can’t imagine what I’ll do when I see one. 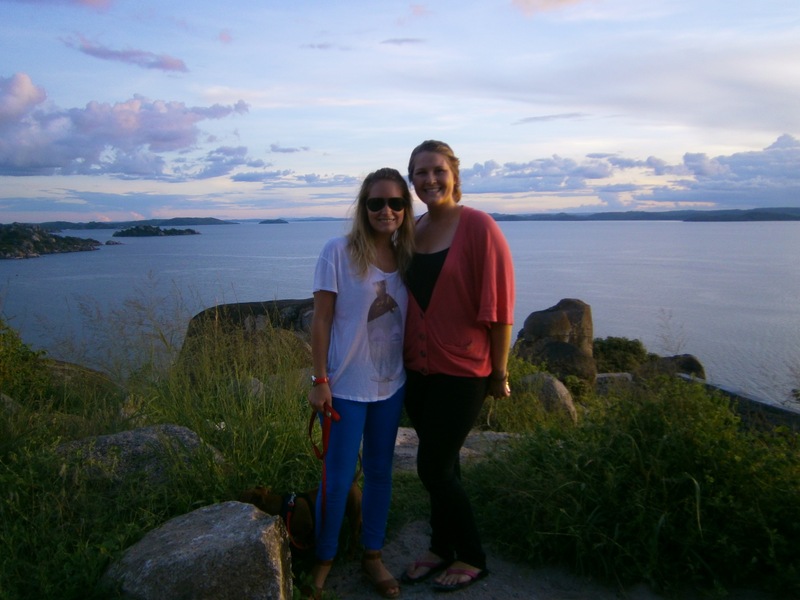 After driving for 4 hours and spotting zebras, wildebeest, and baboons along the way, we made it to Mwanza! 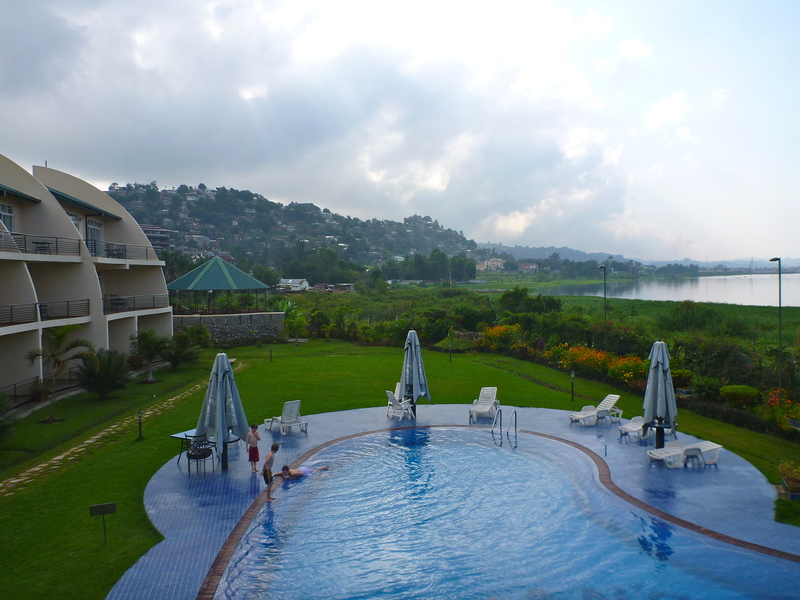 That first night we stayed in a wonderful hotel on Lake Victoria called Ryan’s Bay Hotel. After a 10 hour journey, I was beat and super happy to relax in my new home.